In some of my earliest memories, three-year-old me enters a cavernous room filled with light and lined with books: the Bridge Street branch of the Grand Rapids Public Library, where my mother took me for regular visits. I would emerge onto the street, my little arms full of books, my little world full of the possibilities that literacy affords. The book was released last summer to general acclaim, but it’s the sort of book whose audience builds by word of mouth rather than publicity juggernaut, so in case you’ve missed this one so far, I herein I do my part to commend this worthy book to Twelve readers. If you care about teaching, reading, writing, and questions of privilege and inequality, you are likely to appreciate this book as much as I and my students did. Kuo, now teaching at the American University of Paris, was raised by Taiwanese immigrant parents in Kalamazoo, Michigan. She dutifully achieved her immigrant parents’ dream: Harvard. However, rather than taking the next leap on that upwardly mobile trajectory after college to a lucrative career, she signed up for Teach for America and headed to one of the poorest places in the country: rural Helena, Arkansas. Kuo acknowledges in the opening pages the naivete of this move, her “bleeding heart” dreams of making a difference. She was placed in an alternative school where “troublesome” students landed after getting kicked out of the main public school, and she recounts quickly succumbing—despite her usually shy nature—to the clumsy coping mechanisms often characteristic of stressed and under-resourced schools: yelling, punishing, sending to detention. 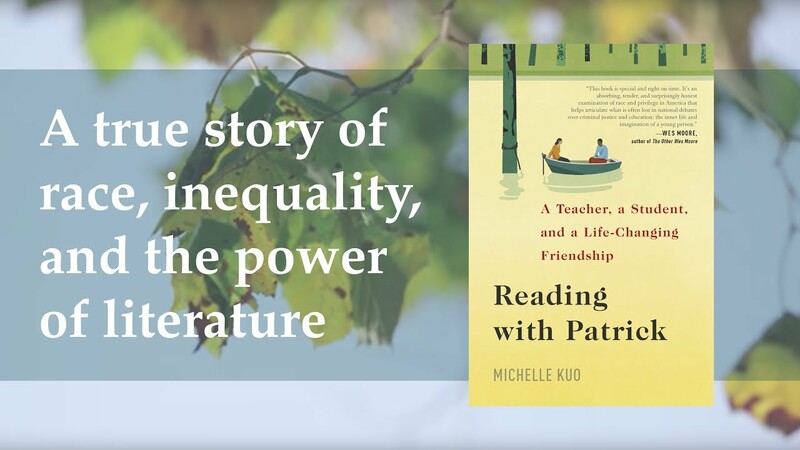 She sticks it out, and by her second year, through trial and error, Kuo hits on ways to connect with the students, especially Patrick Browning, a soulful, gentle eighth-grader. Kuo celebrates heartening moments of breakthrough in the classroom—students eagerly devouring her carefully curated young adult novels, relishing their silent reading periods, learning to open themselves through free-writing. But momentary teacherly triumph cannot overcome the enduring disadvantages these kids face. Their scholarly advances are easily swallowed up by later circumstances. This is not a savior narrative. After anguished deliberation, Kuo leaves the Delta to go to law school back at Harvard. While there, she hears that Patrick, now 19, is in jail for murder. She returns to the Delta to discover what happened: Patrick was trying to defend his younger sister from a drunken, aggressive boyfriend and the fight ended in unintentional disaster. Patrick is devastated by guilt and resigned to his fate. While he waits sixteen months in a fetid jail for his court date—because Helena’s criminal court is only in session four times a year—Kuo arranges to spend another seven months in Helena, using her legal training to help with his case, but even more importantly, visiting Patrick every day to resume his education through reading and writing together. That’s the basic narrative, but along the way Kuo enriches the story with researched considerations of the Delta’s history, jurisprudence, sociology, and economics, as well as of her own Taiwanese-American upbringing, all of it together constructing a fascinating cross-section of American life. My students marveled over how isolated and abandoned the Delta students seemed, literally and imaginatively. Helena was a busy hub of activity during the Civil Rights movement, but Kuo’s students, virtually all African-American, knew almost nothing about history, adrift in their own story. They had little handhold on the great machinations of American public life, as it all seemed so far away. Despite a few courageous and dedicated teachers, their public schools were deeply dysfunctional, and kids rarely finished high school. With a minimally functional local economy, kids more or less expected to wind up pregnant or in jail. All of this is familiar territory, but what’s distinctive about Reading with Patrickis the way it views these intractable social ills from within a particular relationship between two particular, wildly different people with an unlikely connection: books. Never patronizing nor self-aggrandizing, Kuo is persistently clear-eyed about herself, about Patrick, and about the difference their work together can and cannot make. Kuo carefully parses her own motivations, describing the push and pull of her parents’ aspirations for her, her own privilege-guilt and desire to serve, her wrestling with what it means to tell Patrick’s story within her own. She is throughout tender toward and respectful of Patrick, allowing us to see his full context not in order to excuse his mistakes, but to tell a richer, truer story. At the heart of the book is Kuo’s detailed account of their day-to-day lessons while Patrick awaits his court date. This work is far more for both of them than a distraction or even a practical attempt to deliver useful language skills. Instead, it’s an experiment in human connection, and we perceive Patrick’s inner life re-opening like a blossom. He and Kuo read The Lion, the Witch, and the Wardrobe together, and Narrative of the Life of Frederick Douglass. They memorize and recite poems daily by M. S. Merwin, Emily Dickinson, George Herbert, Basho. Kuo cannot predict what lines will move Patrick, and she relishes the surprises that inevitably arise when two different people share a text. Meanwhile, Patrick writes increasingly imaginative and moving letters to his little daughter, only one year old when he was arrested. Income disparity, denied opportunity, racial inequality, mass incarceration—my students are familiar with all these broad concepts. But what struck us most deeply as we discussed this book was how we had taken for granted that marvelous human mystery: the inner life. Or more precisely, the freedom to cultivate and value it. All people have an inner reality, of course, but some of us are offered the opportunity to enlarge it, install windows, create a light, airy space lined with rich and varied experience—like that library reading room I remember from childhood. My students and I reflected with new gratitude on how literacy mediates for us that inner-life cultivation: through conversations, through a network of literary and cultural knowledge painstakingly built, through the self-expressive discipline of writing, through travels and encounters with many kinds of people. We thought, too, about worship and church life, which assumes a transcendent reality and links it directly to our personal, internal ones through prayer and preaching and singing. We noted how we also take for granted the rich treasure house of stories we carry in our minds, stories true and imagined. One student remarked that “the ability to reimagine your identity, to free yourself from your surroundings” is a skill we have to learn. Another student observed how the inner life is naturally generative, meant to be shared. All this is greatly accelerated and expanded through advanced literacy. I’ll let you discover for yourself what happens to Patrick, at least within the narrative arc of the book. But this is more than the story of one determined young teacher and one struggling student. Kuo has managed to capture complexities of the American experience that call for lament and repair, as well as beauties of the human spirit that awaken our gratitude.